Argentina is the world's eighth largest country and is a land of infinitely enchanting landscapes: As you discover Patagonia you will find a part of the world which is still a virgin, unexplored land which offers unique features and landscapes including the majestic Fitz Roy, Torre and Paine massifs, Perito Moreno and Upsala Glaciers as well as the world's most southernmost city of Ushaia. Well-known for its incredible natural beauty, the western side offers endless mountains, lakes, forests and rivers. To the East, on the Atlantic coast, you will be fascinated by its varied marine life including penguin colonies, elephant seals, sea lions and seasonal whale watching. Argentina's great rivers and virgin jungle offer extraordinary flora and fauna along with Iguazu National Park, home of the breathtaking and magnificent Iguazu Falls. At the heart of all this is the bustling capital, Buenos Aires: a contemporary city that is bursting with energy and sophistication. While the spirit of the tango thrives and gaucho heritage is much-celebrated, modern Argentina is more cosmopolitan in its outlook than many of its neighboring Latin American countries. The Argentines have a lust for life that is infectious; this passion shines through in the nation's three great loves: football, food and partying. 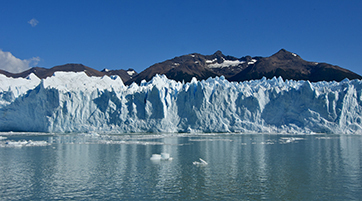 From the snow-capped peaks of the Andes to the dry dusty plains of Patagonia; whether exploring the lush tropical rainforest of Iguazu or sailing past the giant ice flows and glaciers of El Calafate, Argentina provides wonderful, boundless adventures. The climate of Argentina ranges from the great heat and extensive rains of the subtropical north, through to the pleasant climate of the central Pampas and the sub-Antarctic cold of the Patagonian Sea in the south. The main central area is temperate, but can be hot and humid during summer (December to February) and cool in winter. Head to Buenos Aires in September-November and February-March to enjoy warm weather while avoiding the stifling heat. GMT -3 (GMT -2 from third Saturday in March to first Saturday in October).